Anyway, I was watching TV in my grungy graduate apartment (seriously, my roommate was one of the messiest people I had ever met; I was terrified to get near the kitchen, deciding to live off food from the local Starbucks and canned goods), when an ad came up for Disneyland. Again, remember my experience so far in Los Angeles, a little lonely, not connecting with my fellow writers yet, lousy roommate and I was in a big and (let’s be honest) less than welcoming city. Walking into Disneyland that day was not like just going home, it was like returning to every happy memory of my childhood. It was a rush, plain and simple. Now, I had been to Disney World as a child and had fun there, but it never felt like this. It was completely the opposite of everything I was feeling and living in around USC. This was, to avoid being corny, felt magical. It was a gift I wasn’t expecting. The energy, the vibe of the place took my breath away. I was overwhelmed and it was not a feeling I was prepared for. I seriously almost wept. What made that first visit even more great is that it was a rainy day. Which meant, I almost had the park to myself. I was a kid in a candy store as I walked off the Indiana Jones and the Forbidden Eye ride and immediately walked right back on again. There was no wait anywhere that day, and I experienced everything, had lunch and then did everything two or three more times. I was there the entire day and left that evening at closing, exhausted but incredibly happy; like a child after a really good Christmas (I’m talking brand new puppy good). The next day, I felt ridiculous and a little embarrassed. I wasn’t wearing a sweatshirt from the place (I would never be that guy), but I did feel tainted in a way. I talked to some of my fellow writers and realized to my relief I was not the only one that felt that way upon visiting the magic kingdom. If anything that visit opened up conversations for me with fellow writers. One thing I latched on to immediately around Disneyland is the sheer creativity of the place. When it comes to amusement parks, Walt didn’t just invent the printing press, he also invented the books. And while Disney World is nice, there is something special that Disneyland has that I didn’t feel at Disney World. I’ve tried to explain this to people before but always find it difficult to find the right words. Disney was there and he oversaw it. It’s his presence, plain and simple. The vibe around Disneyland became a thing for me, and I would return from time to time when I was living in Los Angeles, not for the rides, per se, but the feeling of being there (There were some visits where I didn’t even go on rides). When I was working on my thesis (an unpublished novel named Cassandra on the Island), I was known to even bring my notepad with me, finding a spot in a corner of the park to write and just watch the people rushing about. Turning that into a business. Making the first full-length animated film. That list doesn’t do it justice since he was advancing the medium every step of the way. He was never stagnant. He just builds and builds and builds. Disneyland was the same way, starting as a small idea inspired by some model trains. That creativity right there to me is awesome. Things were never done for him. He even said at one point, famously, that “Disneyland will never be completed. It will continue to grow as long as there is imagination left in the world.” As an artist, that idea is inspiring and exhausting at the same time. It would be like writing a book that never ends. I mean, even The Neverending Story had to end at some point for the author. I must admit, it does make me sometimes sad when I think that a ride will never be like how I originally remembered it; for example, The Pirates of the Caribbean is now filled with characters from the movies (which is fine). It makes sense though, things need to change. It is what keeps the place alive and keeps it from becoming a full-on nostalgia environment. So things change, things grow, things improve, things are always moving. You can almost find a philosophy of life out of the amusement park. I cannot wait to take my children to Disneyland. I want to see their faces upon experiencing the magical kingdom for the first time. But just as much, I want to talk to them about the making of the place and the creativity behind every inch of the park. So I admit it, I am a fan. Disney is an inspirational individual for me and I really, really wish my brain was wired like his. This entry was posted in Life and tagged Anaheim, Disney World, Disneyland, Haunted Mansion, Indiana Jones, Inspirational, Los Angeles, Mickey Mouse, Pirates of the Caribbean, University of Southern California, Walt Disney, Writers, Writing by Scott D. Southard. Bookmark the permalink. UPDATE: So how many of you have seen the fake movie poster for WALT, a biopic on Walt Disney? 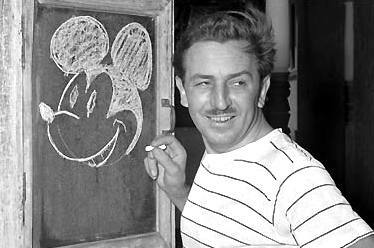 (If you haven’t, you can see it here- http://www.cartoonbrew.com/disney/walt-by-pascal-witaszek.html). It’s been getting a lot of attention. Personally, I think this is entirely doable and I keep working out scenes and dialogue for it in my mind. If I was writing the screenplay, I would focus on his childhood and the early years of animation, stopping the film at the premiere of Snow White. The theme will be the idea of innovation, always striving to break new ground; and I would try to capture that energy he had around himself and projects then. I can even see a second film, that would follow the power and overwhelming responsibility of his empire and the peace he found at Disneyland. The sad thing is the fake poster has Akiva Goldsman on as a screenplay writer right now, and I think he is… terrible seems harsh, predictable and boring seems better… Well, after A Beautiful Mind I have really questioned his ability to write a good script, especially one true to the topic he is trying to capture. Whatever, it is a fake poster. What do you think? What are you waiting for? Write the script! You know you can do it–you have the passion, the sense of history, and the innate love an author must have for her (his) characters (see what I did there)? You have buckets of talent. This is your year. LOL. Thanks! Did you know they are making a film right now about Disneyland after hours. I think that might be interesting.